The thoracic outlet is the area between the ribcage and collarbone. Thoracic outlet syndrome is a rare condition that occurs when there is compression of vessels and nerves in the area of the clavicle. This can happen when there is an extra cervical rib or because of a tight fibrous band that connects the spinal vertebra to the rib. There may be pain in the neck and shoulders, and numbess in the last 3 fingers and inner forearm. Thoracic outlet syndrome is usually treated with physical therapy which helps strengthen and straighten out the shoulders. Nerves coming from the spine and major blood vessels of the body pass through a narrow space near your shoulder and collarbone on the way to the arms. Sometimes, there is not enough space for the nerves to pass by through the collarbone and upper ribs. 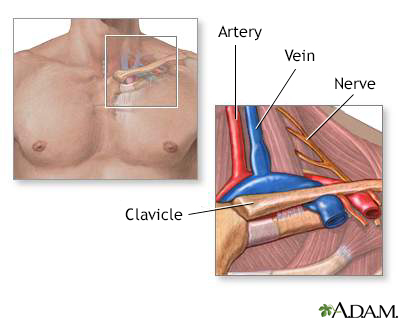 Pressure (compression) on these blood vessels or nerves can cause symptoms in the arms or hands. An extra rib above the first one. An abnormal tight band connecting the spine to the ribs. People with this syndrome often have injured the area in the past or overused the shoulder. People with long necks and droopy shoulders may be more likely to develop this condition because of extra pressure on the nerves and blood vessels. Your health care provider will examine you and ask about your medical history and symptoms. Tests are also done to rule out other problems, such as carpal tunnel syndrome or a damaged nerve due to problems in the neck. Your provider may prescribe pain medicine. If there is pressure on a vein, your provider may give you a blood thinner to prevent a blood clot. You may need surgery if physical therapy and changes in activity do not improve your symptoms. The surgeon may make a cut either under your armpit or just above your collarbone. An extra rib is removed and certain muscles are cut. A section of the first rib is removed to release pressure in the area. Bypass surgery is done to reroute blood around the compression or remove the area that is causing the symptoms. Your doctor may also suggest other alternatives, including angioplasty, if the artery is narrowed. Surgery to remove the extra rib and break up tight fiber bands may ease symptoms in some people. Some people have symptoms that return after surgery. Complications can occur with any surgery, and depend on the type of procedure and anesthesia. Filler AG. Brachial plexus nerve entrapments and thoracic outlet syndromes. In: Winn HR, ed. Youmans and Winn Neurological Surgery. 7th ed. Philadelphia, PA: Elsevier; 2017:chap 250. Osgood MJ, Lum YW. Thoracic outlet syndrome: pathophysiology and diagnostic evaluation. In: Sidawy AN, Perler BA, eds. Rutherford's Vascular Surgery and Endovascular Therapy. 9th ed. Philadelphia, PA: Elsevier; 2019:chap 120.